In glass articles the presence of a residual strain field induces local variations in density (positive in the compression zones, negative under tensile stress), which in turn render the material birifringent; this is at the base of all the characterization techniques relying on “photoelasticity” effects. 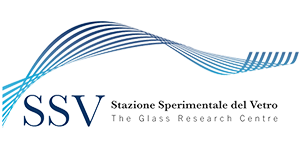 For example, by observing the glass by means of a polariscope/polarimeter, it is possible to obtain a measure of how the sample alters the polarization of the incident radiation by virtue of the residual stress “frozen” inside it. This measure is useful for evaluating the tensile state of glass subjected to toughening or strengthening treatments, or to identify problems of incorrect annealing, or even to understand if the coupling with other glasses or with materials other than glass has been properly designed and performed. To carry out such characterizations, Stazione Sperimentale del Vetro is equipped with manual polariscopes and automated instruments, capable of carrying out a computerized analysis of the photoelastic image.